Energy is everywhere. Physicists have the entire spectrum of electromagnetic energy to play with, from X-rays to radio waves and beyond. Engineers have a whole array of different kinds of energy to employ. New Age has a set of healing energies and mental energies that nobody else knows anything about. 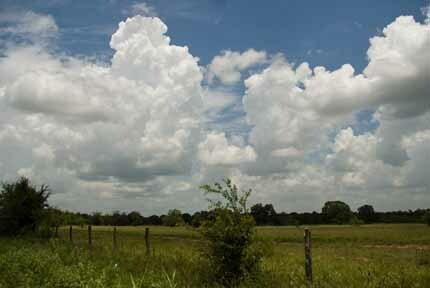 The sun is shining on our pasturelands and the energy flowing to us from the Gulf is plumping up the clouds overhead. And all of life throbs with the organic food energy that it generates within itself. The organic food energy of life is captured by plants from light energy and it is stored in the chemical energy bonds of organic molecules such as proteins, carbohydrates, lipids, nucleic acids and almost everything else that living cells are made of. The organic food energy of life is generated by the process of photosynthesis in plants and other green organisms. Then we eat it and our bodies know how to use it to do the work of staying alive. It is the foundational miracle of life. Photosynthesis is the only source of energy, out of all that energy out there, photosynthesis is the only source of energy for us to stay alive, and whenever our bodies use some of the organic food energy to do the various jobs of staying alive (for example digestion, walking, thinking) — whenever that happens, which is all the time, organic food energy is broken down and heat is released, along with carbon dioxide and water. Energy does not recycle. The plants generate more, and THAT’S what life is all about. I heard Doug Welsh on the radio yesterday say that green plants give off oxygen (they do) and “that’s what it’s all about.” IT’S NOT. We could get oxygen from some technology if we had to. Like astronauts. What we can not do with any technology is maintain the balance that is required for all of life on earth to stay alive, and evidently we can’t think about the real cause of global warming. That’s too bad because we could control global warming, and the awful wars and famines, if we had a mind to, but not with any technology. Only if we decide to behave in a responsible fashion upon this living earth and stop using up more organic food energy than the green plants are capable of producing. It’s all about food for living things; it’s all about global warming; it’s all about the balance between the producers (plants) and the consumers (us) that must be maintained. If it is not maintained, we will never control global warming and we won’t need any oxygen because humans will not be living here in this amazing garden of eden.